Muhlenberg College opens doors to new ideas, discoveries, friendships, and opportunities. Admission: Highly selective; the most important factor is high school record. Entering freshmen are strong academic performers and significant extracurricular contributors. a test-optional plan is available. Financial Aid: About 87% of Muhlenberg students receive grant and/or scholarship aid. Muhlenberg College partners with several other institutions to offer numerous cooperative programs in engineering, finance, management, and health. It’s who we are and what we do. Muhlenberg is a top-tier liberal arts college that offers a more comprehensive array of pre-professional programs than almost any other institution of our size. Here students don’t have to choose between theory and practice or between ideas and their application. They are integrated into what we simply call a Muhlenberg education. Our wide-ranging curriculum features 37 majors and 35 minors across the arts, business, humanities, sciences, and social sciences, as well as programs in Accounting, Business, Education, Entrepreneurship, Finance, Public Health, and, of course, Pre-health, Pre-law, and Pre-medicine. Outside of class, students find countless opportunities for learning, enrichment, and connection, all oriented around the intellectual core. Muhlenberg offers more than 160 study abroad options, and more than half our students study abroad by graduation. There is always something to do on campus, with more than 115 student clubs and organizations, 22 Division III sports teams, and more than 20 intramural and club sports. More than 90% of students live on campus, and housing is guaranteed all four years. 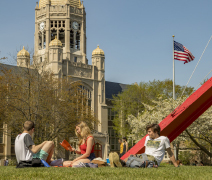 Located less than 90 miles west of New York City and 50 miles north of Philadelphia, Muhlenberg’s campus in Allentown, Pennsylvania, is beautiful and convenient. Allentown is Pennsylvania’s third-largest and fastest-growing city. It’s home to three historic districts and one of the best park systems in the country and was recently honored as a finalist for a global award for excellence, thanks to more than $1 billion in downtown investments. It’s also become a magnet for entrepreneurs and new businesses ranging from tech and design to logistics, finance, medicine, and biotechnology. These businesses offer internships and full-time employment opportunities for Muhlenberg students and alumni. From this rewarding learning experience, our graduates go on to excel in fields of every kind, building great careers, serving and shaping their communities, and enjoying lives of fulfillment and discovery. Typically, 4%–8% of each graduating class enter medical, dental, or law school; another 20% enter other continuing education programs. Among the 55%–65% who enter a career immediately upon graduation, many do so with America’s best-known corporations, banks, schools, and not-for-profit organizations. 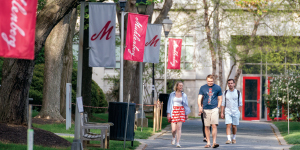 Muhlenberg strives to educate and inspire the most talented and diverse student body we can, and our comprehensive approach to need-based aid and merit scholarships reflects this commitment. About 87% of Muhlenberg students receive grant and/or scholarship aid.